Kreative Kraftwerks' Decorative Soaps are unique and fun! With many scents and shapes to choose from, we offer something for everyone. 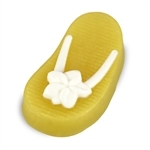 From football soap for the guys on your list to flip flops, rubber ducks and fish for the kids. Give the gift of soap with a splash of fun! Blue-Green Love Soap Made by Morgan Sock Monkey Themed Duck Soap Kids will love this fish in a bag soap! Tropical mango and guava are wrapped with green melon and juicy pineapple. A fresh and intriguing blend of agave, sea kelp, ocean breeze, citrus zests, sparkling bergamot, dewy cyclamen and soothing sandalwood. This adorable soap is scented in Sugar Plum. Approximate weight of each bar is 5.7 oz. This fantastically fruity blend is a whirlwind of succulent peaches, fresh appless, and juicy berries. Sea salt, sea moss and green vetiver round out this fresh ocean fragrance. Kreative Kraftwerks offers unique decorative soap to please everyone on your gift-giving list.